Barry County is a county located in Southwest Missouri in the United States. Its county seat is Cassville. The county was organized in 1835 and named after William Taylor Barry, a U.S. Postmaster General from Kentucky. 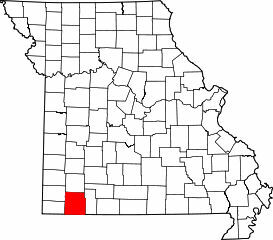 Cemeteries of Barry County, Missouri are located across the county. Listed here are cemetery records that have been published online. According to the 2000 U.S. Census, the county has a total area of 790.89 square miles (2,048.4 km2), of which 779.06 square miles (2,017.8 km2) (or 98.50%) is land and 11.83 square miles (30.6 km2) (or 1.50%) is water. Roaring River State Park is located in the southern part of the county, amid the Mark Twain National Forest. As of the census of 2000, there were 34,010 people, 13,398 households, and 9,579 families residing in the county.